The Chocolatería de San Ginés Spanish Restaurant in Madrid doesn't currently allow online bookings here. However, our online restaurant booking system allows you to choose from amongst dozens of the best Madrid restaurants with completely free reservations. Many of Madrid's restaurants also have special offers and promotions. You can see them all here. Or go to our main Madrid Restaurants page. Chocolatería de San Ginés is a traditional restaurant offering Spanish cuisine. Note that although GoMadrid.com strives to maintain all information about Chocolatería de San Ginés up to date, the prices mentioned are only an indication and may not reflect the exact value of your meal. The Chocolatería de San Ginés is located in a very small street called Pasadizo de San Ginés, next to the Church of San Ginés, close to Puerta del Sol and just round the corner from Calle Arenal. To get there, start at the Puerta del Sol and walk down Calle Arenal. Take the second street on your left, just after the Joy Eslava discotheque. This small street is Pasadizo de San Ginés, and the Chocolatería de San Ginés is situated at number 5. Please also see the map below. This traditional white-marbled bar was established in 1894 and is famous for its speciality: chocolate con churros. 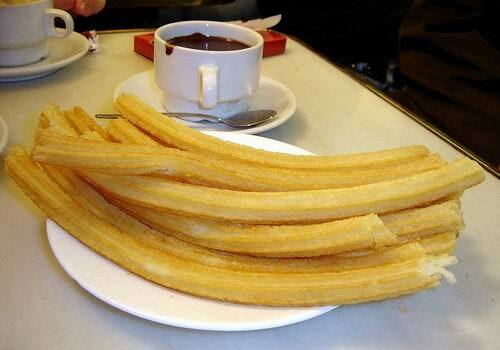 Churros are light, crispy sticks of fried dough (see photo), the dough mixture having been made from water, flour and salt and then quick-fried in a large boiling vat of oil. The traditional method is to slowly pour the mixture into the vat while gently stirring the oil with a long stick, allowing the dough to fry and solidify in a large spiral, which is then cut into small sticks with scissors. Traditionally, churros are eaten with a cup of hot, thick chocolate, dipping and dunking the churro into the chocolate to enjoy the mouth-watering contrast of the slightly salty churro with the sweeter chocolate. Perhaps some of our readers find it difficult to believe that a simple water and flour mix can produce anything even slightly tasty, but the above description really doesn't do justice to the final taste of chocolate con churros, which really has to be experienced first-hand to appreciate, and can almost become addictive, particularly after a night out in the city enjoying Madrid's nightlife! And in fact, the Chocolatería de San Ginés is almost as famous for the hours it keeps as for its churros, staying open all night long until 6 or 7am and often seeing its busiest hours after 4am on weekends, when the hungry revellers turn up in droves to sample the fare, or on New Year's Eve when you'll almost certainly have to endure long queues to get served. If you've been here before, try some porras instead of the churros. Porras are a larger, thicker version of the churro and sometimes make a nice change. Whatever you eat, it's quite an experience just to be in this cafeteria, since it maintains much of its original decor, with the marble-topped bar, wood panelling and the old wall-clock. All in all, this is definitely one of those experiences that really defines a city, and one you shouldn't miss if possible when in Madrid. 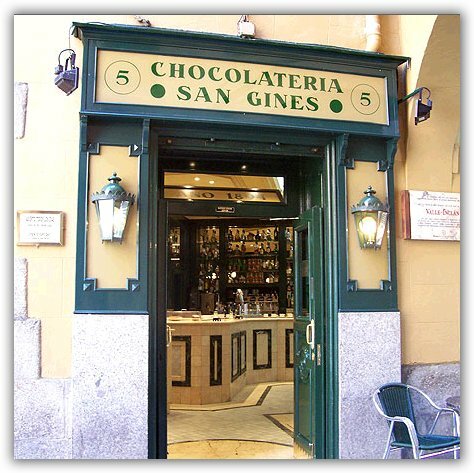 The address of the Chocolatería de San Ginés restaurant is: Pasadizo de San Ginés, 5, 28013 Madrid. The nearest Metro station is Sol. Please see the Chocolatería de San Ginés restaurant location map below.